Lady Bracknell speaks for 1-2 minutes in this comedic monologue intended for older actresses. 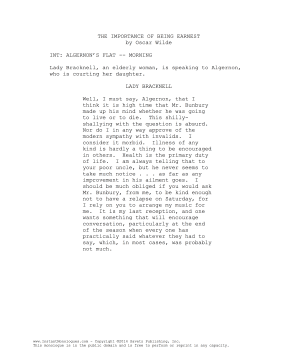 Lady Bracknell, an elderly woman, is speaking to Algernon, who is courting her daughter. Well, I must say, Algernon, that I think it is high time that Mr. Bunbury made up his mind whether he was going to live or to die. This shilly-shallying with the question is absurd. Nor do I in any way approve of the modern sympathy with invalids. I consider it morbid. Illness of any kind is hardly a thing to be encouraged in others. Health is the primary duty of life. I am always telling that to your poor uncle, but he never seems to take much notice…as far as any improvement in his ailment goes. I should be much obliged if you would ask Mr. Bunbury, from me, to be kind enough not to have a relapse on Saturday, for I rely on you to arrange my music for me. It is my last reception, and one wants something that will encourage conversation, particularly at the end of the season when every one has practically said whatever they had to say, which, in most cases, was probably not much.